For those of you who have, over the years, become expert at controlling videogame spaceships, Virus offers a new challenge Its simulated 3-D universe gives you a chance to pilot your craft not only around your computer screen's 2-D plane, but also "into" and "out of" the screen. Of course, this added control makes piloting your hoverplane a skill that you'll need to spend some time mastering; but chances are you'll agree that the effort was worth it. The scenario: It seems that wave after wave of alien spaceships are attacking the planet and spreading a nasty "red virus." The virus spreads quickly, mutating the vegetation, thus changing the healthy green landscape to a sickly brown. You are the pilot of a state-of-the-art hover-plane and have at your command a laser cannon, a long-range scanner and a few homing missiles. It's up to you to destroy the alien invaders and stop the spread of the virus. 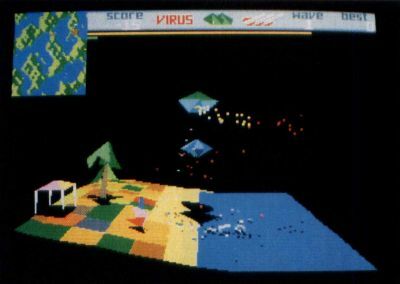 The long-range scanner, located in the upper left of the screen, gives you a full, overhead view of the landscape, and the alien ships can be seen there as colored dots. (Your hoverplane is also marked on the map). You need to keep referring to the long-range scanner in order to fly the hoverplane to the right locations. Flying the hoverplane is the tricky part. It can be rotated to any direction and positioned with its nose up or down. When you apply thrust, the hoverplane will move rapidly in the opposite direction of the thrust. To slow down, you must apply reverse thrust (unless, of course, you are going up, in which case gravity will eventually take over). The hoverplane can be controlled either with the mouse (very difficult) or using the keyboard (the better alternative). If you're not happy with the keys the programmer's have chosen to control the hoverplane, you can completely redefine them. As I said, you can fly the hoverplane in any direction, including "into" and "out of" the screen. No matter which direction you fly, the graphics will keep up with you. And you will be impressed. The main display shows the landscape in a "spotter" view—that is, as if you were watching your hoverplane from another craft a few yards away. As you fly over the landscape, you'll be treated to a marvelous 3-D effect. The full range of movement allows you to actually move around and behind objects, as well as fly over them from any direction. Though the graphics aren't finely detailed, they are nonetheless impressive. During a round of play, you must keep your eye on the line that shows how much fuel you have left. If it runs down to zero, you'll crash and lose a life. At the end of each wave, you'll be shown how well you did, with the amount of infected and uninfected areas listed as a percentage. With Virus, Rainbird has offered up a graphically interesting game. However, mastering the game's controls requires practice, especially if you expect to manuever your hoverplane successfully when battling the alien ships. If you're not a lazy gamer, this one may hit the spot. Recommendation: For those willing to practice.